This weekend will find me on my very first camping trip ever and I am quite excited about it! I’ll be heading up to Cold Spring area with a few friends who are gearing up for their trip of a lifetime to Machu Picchu, and they’ve generously agreed to take me along and show me the ropes. I’ve been told I won’t need to bring an axe. I must admit, I was a little disappointed. 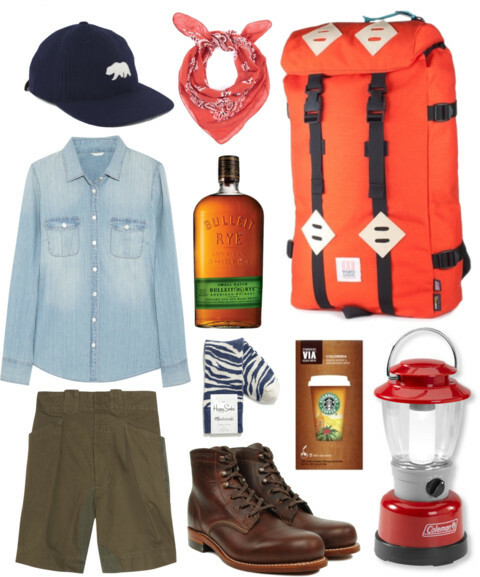 Inspired by my outdoorsy turn this weekend, my kit includes a some essential items that don’t sacrifice style for utility — or vice-versa. I especially love the Taylor Stitch x Ebbet’s Field ballcap! Such a classy way to show my California pride. Aspirational goal: not being eaten by a bear. It’s the Bridgehampton Polo Club’s 2012 season closing weekend at Two Trees Farm. Info for spectators can be found here. Alice Carey has amazing style. Read her feature on Advanced Style. Thank you to Nat for the tip! Out this week: Forbes lists the 100 Most Powerful Women in the World. What’s more interesting, Gaga at 14 or Queen Elizabeth at 26? Really hoping you mean the bear on the hat and not the bears that might eat me. Right, Mom…? You are currently reading QC Prêt-à-Porter || Summer Camp at Quite Continental.